Exploring the challenge of rehabilitating countries after civil wars, this study finds that attempting to transform war-shattered states into liberal democracies with market economies can backfire badly. 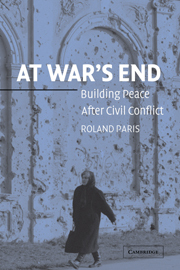 Roland Paris contends that the rapid introduction of democracy and capitalism in the absence of effective institutions can increase rather than decrease the danger of renewed fighting. A more effective approach to post-conflict peacebuilding would be to introduce political and economic reform in a gradual and controlled manner. Part I. Foundations: 1. The origins of peacebuilding; 2. The liberal peace thesis; Part II. The Peacebuilding Record: 3. Introduction to the case studies; 4. Angola and Rwanda: the perils of political liberalization; 5. Cambodia and Liberia: democracy diverted; 6. Bosnia and Croatia: reinforcing ethnic divisions; 7. El Salvador, Nicaragua, and Guatemala: reproducing the sources of conflict; 8. Namibia and Mozambique: success stories in southern Africa? ; Part III. Problems and Solutions: 9. Bad theory, bad practice: the limits of Wilsonianism; 10. Towards more effective peacebuilding: institutionalization before liberalization; 11. Lessons learned and not learned: Kosovo, East Timor, Sierra Leone, and beyond.